It’s well known that presidential approval ratings are a powerful predictor of election outcomes. President Obama’s current 47 percent approval rating would be among the lowest approval ratings of any incumbent president who went on to be re-elected. What’s striking, however, is that Mr. Obama may be more popular than he should be. That is the result of some new analysis that will be included in a book I’m writing with a fellow political scientist, Lynn Vavreck, on the 2012 election. I’ll preview a bit of it here. Presidential popularity hinges primarily on several factors. There is, for many presidents, an inexorable decline in popularity that comes with time. The longer a president is in office, the less popular he is. Popularity is also affected, positively or negatively, by salient events like scandals, wars and foreign policy crises. Finally, and most important, there is the economy. Mr. Obama’s approval rating has thus far experienced relatively few ups and downs linked to singular events. There have been no big scandals, for example. The Solyndra bankruptcy, the General Services Administration’s over-the-top Las Vegas conference and the Secret Service prostitution debacle haven’t quite proven to be Watergate, Iran-contra or even Whitewater. The killing of Osama bin Laden in May 2011 produced only a temporary increase in approval. Instead, Mr. Obama’s initial popularity in the “honeymoon” after he was inaugurated has generally been on a gradual decline — a trend that is most likely traceable to the damaging recession and weak recovery, which have created persistent pessimism about the economy. • The approval rating from the previous quarter, since approval ratings are cross-correlated with themselves. Thus, we exclude the first quarter of each president’s term. We also exclude two quarters in which presidents overlapped (after John F. Kennedy’s assassination and Richard M. Nixon’s resignation). • Three key economic indicators: the unemployment rate, the change in gross domestic product since the previous quarter, and the change in inflation since the previous quarter. • The length of time in office (measured in quarters). In fact, he is more popular than expected, and consistently so throughout these three years. His quarterly approval ratings are, on average, nine points higher than expected. 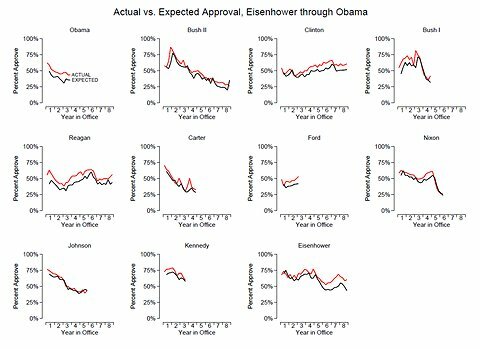 Only two other presidents have experienced a discrepancy between expected and actual approval in their first terms that was larger than the discrepancy in Mr. Obama’s first three years. One was George W. Bush, and this arises largely because the model doesn’t fully anticipate the quickness and size of the “rally effect” that took place after Sept. 11, 2001. The other was Ronald Reagan, whose first-term approval ratings exhibited more fluctuation than Mr. Obama’s but were about 10 points above the model’s expectations, on average. Mr. Obama’s higher-than-expected approval rating is surprising for two reasons. For one, since 2009 the economy has been in not a garden-variety recession, but a deep and prolonged slump. The economic measures in our model capture some of its characteristics — like unemployment — but not all, like the rise in long-term employment. Second, Mr. Obama’s race may also depress his approval rating. Studies of the 2008 election have found that Americans’ views of blacks were strongly associated with their views of Mr. Obama, and racial prejudice may have cost Mr. Obama about three points of vote share. Our model does not take account of race either, which is inevitable when there has been only one nonwhite president. 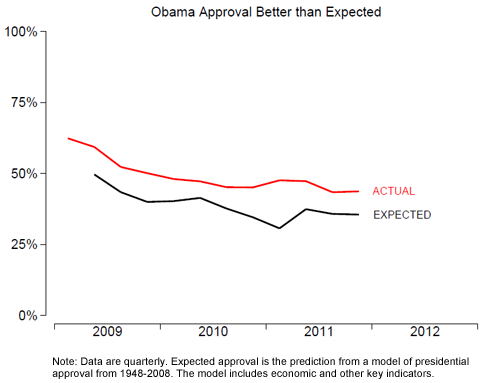 So why would Mr. Obama be more popular than the economy and other factors might predict? One possibility is his personal likeability. Despite the armchair diagnoses of some pundits, large majorities of Americans perceive him as warm, empathetic and a good communicator. Although many fewer Americans approve of his performance in office, perhaps his personal appeal has boosted his job approval among some Americans. A second possibility concerns whom Americans blame for the economy. Based on some recent polling data, I found that Mr. Obama continues to receive less blame than George W. Bush for the country’s economic problems. If, hypothetically speaking, every American blamed Mr. Obama and Mr. Bush equally, his approval rating would be about 11 points lower — enough to erase the gap between actual and expected approval in the first graph above. Of course, “hypothetically speaking” is the best we can do, short of replaying history and having Americans blame Mr. Obama more. Nevertheless, “the blame game” conceivably has something to do with why Mr. Obama has remained more popular than we might expect. And if his better-than-expected popularity continues, it might give him just enough of an edge to defeat Mitt Romney in what is likely to be a close election.